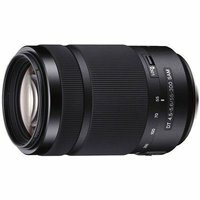 The Sony 55-300mm f4.5-5.6 SAM ED Lens is a telephoto zoom lens with the standard Sony A-Mount. Quick, quiet and professional, the Sony 55-300mm lens is designed for advanced performance at a range of focal lengths for all Sony SLT (Single Lens Translucent) and DSLR (Digital Single Lens Reflex) cameras featuring an APS-C sized sensor. Extra-low dispersion glass reduces chromatic aberrations to sharpen image quality at medium to long focal lengths.